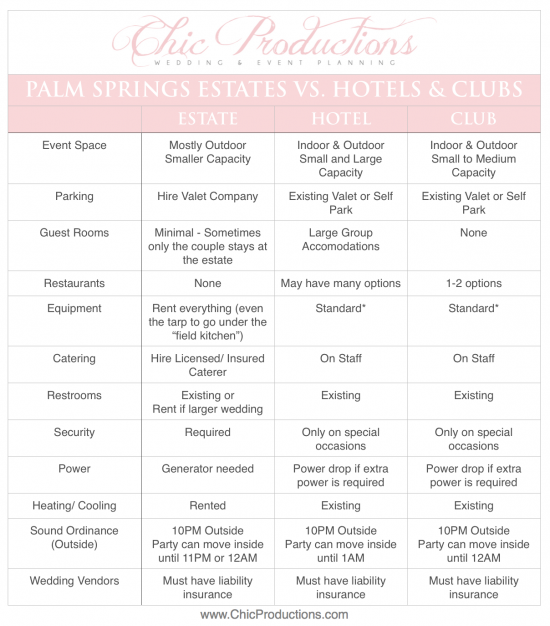 Are you trying to decide if you should have your Palm Springs wedding at an estate versus a club or hotel? We’ve created a nifty matrix to help you make your decision, so you don’t get blind-sided later on. Once you understand the differences between Palm Springs Estate weddings versus Hotels and Clubs, you’ll make smarter planning choices. *The equipment section needs a little explaining don’t you think? Equipment means everything you’ll need for your wedding. (Tables, chairs, linens, flatware, glassware, bars, kitchen equipment, dance floor, etc.) Estates typically don’t have any of these items in their inventory, where hotels and clubs do. I’ve created the term “Standards” for hotels and clubs as they each have a standard set of these items. Standard items are unique to each venue, but automatically come with your event fee. Check out the “Palm Springs” Category to the right for more tips and tricks on having your wedding in the desert or search “Palm Springs Estate Weddings” in the search bar for information to help you plan your estate wedding in Palm Springs. Happy Planning!